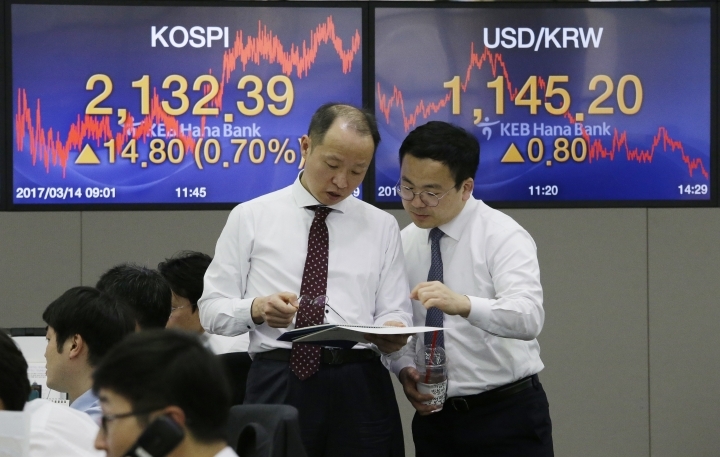 HONG KONG — Asian stocks fell Wednesday as the Fed met to decide on whether to hike interest rates in view of improvements in the U.S. economy. 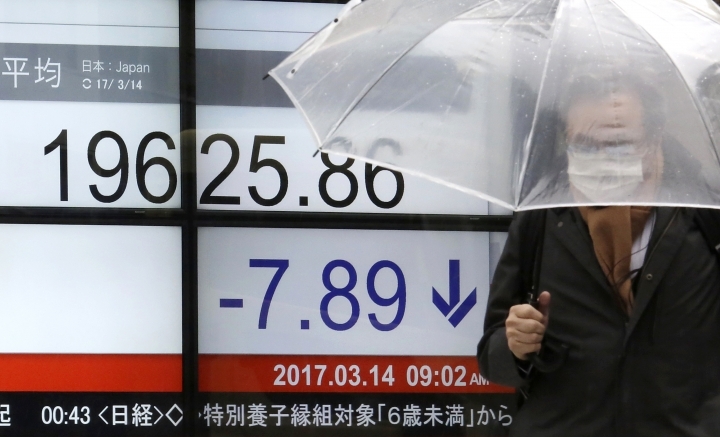 KEEPING SCORE: Japan's benchmark Nikkei 225 stock index lost 0.3 percent to 19,549.43 and South Korea's Kospi shed 0.3 percent to 2,128.12. The Hang Seng in Hong Kong slid 0.4 percent to 23,724.91 and the Shanghai Composite Index dipped 0.1 percent to 3,235.82. Australia's S&P/ASX 200 sank 0.4 percent to 5,736.00. Shares also fell in Taiwan and most of Southeast Asia. FED IN FOCUS: Economists forecast that the U.S. central bank will raise interest rates by a quarter of a percentage point when policymakers wrap up their two-day meeting on Wednesday, or Thursday morning in Asia. Analysts said a rate hike, only the Fed's third in a decade, is already priced into financial markets and investors will be looking to see what Fed chief Janet Yellen will be saying about the pace of future increases. Higher rates would make the U.S. more attractive and could siphon away capital from emerging markets and weaken their currencies. MARKET INSIGHT: "A U.S. rate rise is now baked in to the market cake," said Michael McCarthy, chief strategist at CMC Markets. Now, "the focus will shift to board projections. Any increase on the current indications of a further three hikes this year could disrupt equity markets." ENERGY: Oil prices recouped some losses after a slump in U.S. trading fueled by oversupply concerns. Benchmark U.S. crude rose 75 cents to $48.47 a barrel in electronic trading on the New York Mercantile Exchange. The contract lost 68 cents, or 1.4 percent, to settle at $47.72 a barrel on Tuesday. Brent crude, which is used to price international oils, added 67 cents to $51.59 per barrel in London. WALL STREET: Major U.S. benchmarks ended lower. The Standard & Poor's 500 index fell 0.3 percent to 2,365.45. The Dow Jones industrial average fell 0.2 percent to 20,837.37. The Nasdaq composite fell 0.3 percent to 5,856.82. CURRENCIES: The dollar climbed to 114.80 yen from 114.76 yen late Tuesday. The euro rose to $1.0617 from $1.0605. The pound rose to $1.2160 from $1.2153. The Financial Capital is your independent source for finance information and advice. We provide insights and offer advice from financial experts so you can make the best decisions. Copyright © 2015 - 2019 The Financial Capital. All Rights Reserved.